As the 1600+ entries in this blog provide evidence for, emerging generations are moving into downtowns, driving less, walking more, living in smaller homes they can actually afford, preferring local businesses and slower food, prioritizing health,going green and valuing community and social networking like never before. It keeps coming up again and again, that the one amenity that does a remarkable job of fulfilling these values is the timeless piazza. The piazza is the heart and soul of a town. It is where the town comes alive. It never sleeps; it is filled with the sounds and smells of local life at almost every hour of the day. Yet it is also much more than just a neighborhood square – it is a living, breathing entity with a distinct personality. A day in the piazza overflows with music, romance, laughter, aromas of fresh coffee or bread baking, and the richness of local culture. Entering a piazza can be like stepping back in time. The noise and distraction of moving vehicles, ubiquitous throughout the city, are absent. Beautifully crafted buildings share the square with bustling cafes and shops. It is often the most picturesque spot in town. There is something special about the light in a piazza – it can have an almost dreamlike quality and glows with a warmth and vitality that is unique to the city. People of all ages come to the local piazza to see and be seen. They congregate to hear the latest gossip and to spend time with family and friends. For some, it would be hard to say which is more important – a kitchen with a big communal table or the local piazza. For many, life in the piazza starts at an early age. Children first come in strollers or baby carriages. Men and women of all ages coo over the children. As soon as they can toddle, kids start chasing pigeons in the square and learn to play with other kids. Children use the piazza as a personal playground. Often grandmother or grandfather is there to assist. It is a place where young children can play and learn under the supervision of family and the entire community. Young boys and girls eagerly look forward to weekend outings to the piazza where friendships form and flourish. It is the cornerstone of social life in the city. Young adults grow up spending a lot of time in the piazza – watching a movie or the big game on a giant screen, taking it all in at concerts and festivals, even exerting themselves via climbing walls and ice skating rinks – and then bring their own families to the square later in life. Many people have found love and met spouses there. It is not uncommon to see young lovers strolling through a piazza, holding hands. Weddings take place in the piazza. In addition to being the social center of town, the piazza is also a bustling marketplace for fruits and vegetables, crafts and art, and an endless array of other goods. Non-motorized pedestrian streets with charming shops often lead into the piazza and life tends to spill out into them. There is always at least one local coffeehouse in or near the piazza. In the late afternoon and evening the market crowds are usually replaced with those for outdoor cafes, bars, restaurants that bring people together to talk, mingle, and watch other people. Later in the night, cafes compete with one another for patrons to listen to live music that fills the piazza with wonderful sounds. On many occasions, modern-day street performers entertain people in the piazza across a wide spectrum of the arts. Mimes, people mimicking statues, acrobats, singer, and musicians playing a myriad of instruments all compete for attention. The piazza is the town’s central stage or outdoor theater. Piazze are also hubs of political activity. Throngs of people fill a town’s square during rallies for political parties or causes. Sometimes important referendum committees organize concerts in piazze. The media occasionally uses the piazza as a background for interviews with local politicians. When the piazza is not teeming with people during special events and celebrations, life follows certain rhythmical patterns. On weekdays many older people typically mill around the piazza, watching people, engaging in animated conversations with friends, or playing cards. During the winter they follow the sun around the piazza and in the summer months they chase the shade. Sunday mornings are a special time in the piazza. Churchgoers like to stop at the local cafe to enjoy a cup of coffee or tea. Men and women sit, surrounded by others on their smartphones and iPads, completely engrossed. Some cafe regulars perch at tables for hours with their laptops. On Sundays it is common to see multi-generational families spending time together in the piazza. Cafes in the piazza are very important meeting spots. Most people, who live nearby, stop for a morning coffee on the way to work. The cafes are typically buzzing with activity, whether it is workers taking a break or people gathering after a long day to meet friends, swap stories, or play a lively card game. Those entrepreneurs who overlook this live stage in second floor workplaces are continuously grateful they’re immersed in culture that inspires them on a daily basis. So are the young-at-heart singles and couples living in studio apartments above, the active types who can’t sleep at night if it’s too quiet. Saturday and Sunday evenings are the most popular times, when the piazza comes alive and throbs with activity. People of all ages fill the square, carrying on animated discussions, as if the piazza were the town living room. It is during times like this that the vibrancy and passion of the piazza is most palpable. There is only one piazza designed to function as an authentic piazza in the U.S.; the Piazza in Philadelphia. It’s not the most beautiful architecturally, but it is a true piazza in that it’s completely enclosed by buildings on all sides without any streets running through it and is regarded as the heart of the community. Expect this decade to witness a renaissance of piazzas. Most recently, it was voted as the #1 most desired downtown amenity in Bristol, Connecticut. Why? Because they were given a piazza as an option to even vote on. Try providing it as a possibility in your city – you’ll see. This is a Top 20 post. 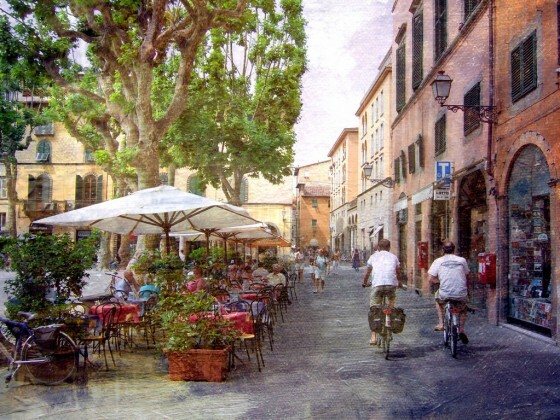 Image of Piazza Anfiteatro, Lucca, Tuscany, Italy by Linda Yvonne. Great post and very well written. I couldn’t agree more. Integrating vibrant spaces such as these into our urban fabric is vital in assuring sustainable communities.